Kalamkari or Qalamkari art literally means pen-art. The Persian term kalam means pen, and kari means craftsmanship. This is a form of hand-writing or block printed painting on cotton fabric and is done in many different parts of India. Kalamkari work developed and evolved in Machilipatnam, Andhra Pradesh, largely due to the patronage of the Golconda sultans during the Mughal era. It had many business ties with Persia, due to which the Kalamkari industry came up in a huge way in India. It is said that in the olden days, there used to be large groups of painters, singers and musicians (popularly known as Chitrakathi), who moved around each village, telling people great stories from Hindu mythology. With time, they started illustrating these stories with impromptu paintings made on canvas sheets. This is known how Kalamkari was born. It then went on to evolve steadily through the centuries. There are predominantly two types of Kalamkari art in India. The first is the Srikalahasti style and the other, the Machilipatnam style. The Srikalahasti style of this art involves using the pen or kalam for freehand drawing and then filling the colours inside. The piece here is developed entirely by hand. The style of Kalamkari is woven around temples and deities and depicts all religious object such as temple hangings, scrolls, and chariot banners and so on and mythological scenes based on great epics like Ramayana, Mahabharata, puranas and so on. Kalamkari paintings incorporate only natural dyes taken from plants and require the artisan to undertake 17 complex of procedures complete one work of art. Smt. Kamaladevi Chattopadhyay is mainly responsible to maintain and develop the art of Kalamkari, as the first Chairperson of the All India Handicrafts Board. At present, the J J Schools of Art in Mumbai is experimenting with the potential of Kalamkari art on silk Ikat (a form of tie-and-dye textile popular in Pochampally, Andhra Pradesh. The fabric used in Kalamkari acquires a certain gloss due to being treated by various natural mixtures and dyes. It is first immersed in a mixture of resin (myrabalam) and cow’s milk for about an hour. Then contours are marked on it with a bamboo soaked in a mixture of fermented jaggery and water. Then vegetable dyes are used on the same. The fabric is washed after each colour treatment, so each fabric colour treatment, so each fabric undergoes about 15-20 washings. Tints and shades are obtained with the help of plants, seeds, crushed flowers and cow dung. 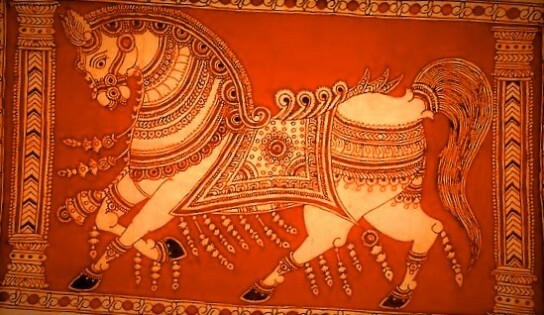 Even today, Kalamkari craft is practiced in many families of Andhra Pradesh and forms a major part of their livelihood. Though Kalamkari art witnessed a slight, temporary decline in between, it was revived in India and abroad and has been given tremendous worldwide exposure since the 18th century, especially by the English during the British Raj in India.